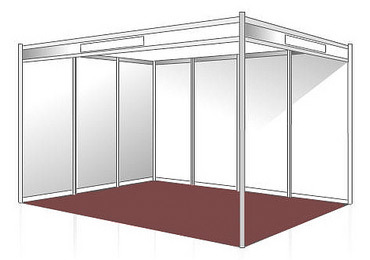 Exhibition Stands, Exhibition Stands UK, Exhibition Services | 200m2 | Exhibition Shell Schemes: What are they? Exhibition Shell Schemes: What are they? Every month or so, we receive a call asking us to explain what an ‘exhibition shell scheme’ is. For many years now, exhibition shell schemes have been the default option for most organisations attending a show. Usually the exhibitor pays the event organiser a set fee for the floor space and the location plus an undisclosed extra for a basic ‘shell’. A shell scheme package is usually a hassle free option because you are buying in services from the event organiser. The package typically includes stand walls, lighting, carpet and a power socket. A typical shell scheme package is like a blank canvas. The shell scheme walls are usually white or grey and consist of metre wide panels – this allows the exhibition organiser to increase the size of the shell scheme for each client very easily. In addition, every shell scheme comes with a fascia board displaying your company name and stand number. The problem is, most exhibition stands based on a shell scheme will look the same. That’s fine if you’re just using the stand to meet existing clients. But what if you want to attract passers-by on to your stand? A shell scheme without any personalisation makes it very difficult for you to stand out from the crowd! Consequently, most organisations will attempt to personalise their stand space by adding ‘pop-up’ roller banners in the corners or by sticking posters on the back wall. They may even add a basic table and some folding chairs and maybe even a brochure stand too. The problem is, everyone else with a basic shell scheme will be doing the same thing. To really stand out, you need to think about professional shell scheme graphics – large format graphics which are designed to fit snugly on to each panel. The results can look really impressive. BUT here comes the BUT! A lot of organisations struggle to re-use their shell scheme graphics – panel sizes are not always standard. Before making a decision, consider taking a ‘floor space only’ package and then buying or renting your own stand equipment. This will ensure the graphics can be re-used. The costs of a CROSSwire stand, for example, are far less than you might think – especially if you are looking for an exhibition stand hire solution. Get in touch if you’d like to discuss the options available. Previous Previous post: Exhibition Furniture Hire: Our Top Tips! Next Next post: Are exhibitions growing or shrinking in the present economic climate?